“I woke up the next morning, in distress, telling myself that I needed to have more control over my eating and then everything would be ok.” This sentence or a similar one may sound familiar to several individuals. In a society that places a great deal of importance on weight loss and healthy eating, most people believe that the problem is related to their “lack of control," rather than something greater. Binge Eating Disorder (BED) was first recognized as an eating disorder in the DSM V, which was published in 2013 (APA, 2017). The diagnostic criteria for BED include, but are not limited to, the perception of loss of control while eating a larger quantity of foods than considered “normal” in a specific period of time in addition to extreme feelings of guilt and shame afterwards. While diagnostic criteria for BED does not include compensation following a binge (e.g., vomiting, laxative use). People with BED often report that they try to make up for the behavior the following day through restrictive eating. This restrictive eating behavior can present itself in several forms, such as using food rules to eat “healthier,” avoiding certain foods or limiting oneself to a certain amount of calories. Sometimes just the idea that tomorrow will be different can keep the binge cycle going. The goal of your dietitian is to target restrictive eating, which normally perpetuates the cycle of feeling overly hungry then bingeing. Messages from social media often seem to condition us to believe that we can control what our bodies want and what they should look like. This battle can have dire consequences on our physical health, our mood and our emotional well-being. One example is a client who I will name Sandra. Sandra has always had a very difficult relationship with her body, creating food rules to try to control her weight and shape. For years, she attempted several diets, which worked initially, but then she ended up heavier and more demoralized after each one. She became confused as she was following her food rules and eating “healthy,”but was unable to lose any weight. Often, Sandra would come home from a long day of work and describe “zoning out” and eating whatever “forbidden foods” she could find over a period of an hour. When she would finally “snap out of it,” she was filled with feelings of guilt, shame and loathing for herself. She would reassure herself by saying that this was the last time and that she was going to get things under control the following day; she would get rid of all the junk food in her house and start anew. While this may seem like a good strategy, this is exactly what I would NOT recommend a client to do. Food rules typically perpetuate the cycle of loss of control(led?) eating. It is not a lack of control that leads to bingeing; it is instead primarily the emotional relationship people have with food and their body (amongst other reasons). Stopping the cycle: after a binge, do not try to “get back on track”. Reconnecting with your body: try asking yourself how hungry you feel before a meal and how satisfied you feel after a meal. Try to let your body guide your food choices, rather than deciding what it should be having. Accepting all foods: there is no such thing as a good food or bad food. All foods are good and serve different purposes in our lives. Eliminating a food or food group simply makes it novel and more interesting which leads us to become preoccupied with the food. Eliminating mindless eating: if you eat at your desk, in front of the TV or in the car, this one is for you. Take time to just EAT and taste the food you’re putting in your mouth. It will feel much more satisfying. Please note the strategies above are NOT as simple as they may seem. If you can identify with this article or know someone who has an emotional relationship with food, it may be beneficial for them or for you to talk with a Registered Dietitian. Please don’t hesitate to reach out. American Psychiatric Association. (2017). DSM History. Retrieved from https://www.psychiatry.org/psychiatrists/practice/dsm/history-of-the-dsm on June 19th, 2017. Binge Eating Disorder Association. (2016). Characteristics of BED. 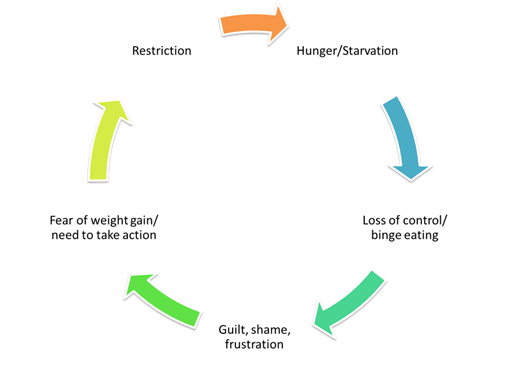 Retrieved from https://bedaonline.com/understanding-binge-eating-disorder/symptoms/ on June 19th, 2017.